It’s a pretty silly exercise that won’t get much notice by anyone in the real world, of course. After all, the whole point of a picket line is an in-your-face, annoyance to regular folk who just happen to be inconvenienced by union thugs walking the streets. On the internet, all one need do to avoid them is just not click there! That being said, it is an interesting thing to see. A virtual protest! Certainly a new experience. Now here is the hilarious part. UnionFacts.com added their own character to the picket line intruding on the socialists and whiners picketing their company! For those of you unaware, UnionFacts.com is an anti-union organization that informs the public on a daily basis of the evils unions do. So, the folks at UnionFacts.com on their LaborPains.org blog crashed the picket line and went in with their giant sign advertising UnionFacts.com and exhorting all the slackers to get back to work and quit whining! 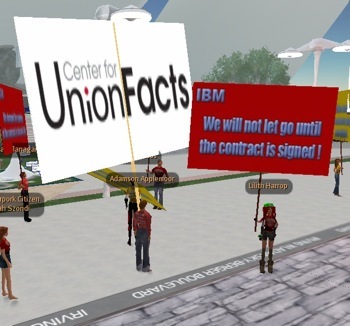 No user commented in " Unions Picketing in Virtual Reality on the Web? "